Eric M. Overholt, Esq., Attorney at Law is an experienced attorney who advocates for people involved in workers' compensation cases. Clients receive a free initial consultation at the law office to discuss a workplace injury, where they are met with sound advice regarding how to proceed. Attorney Eric M. Overholt guides people through the benefits application process and aggressively pursues an appeal for those whose benefits were denied. Over the course of his career, Mr. Overholt has obtained up to seven-figure awards for clients who suffered severe injuries, including quadrapelegics, parapalegics, amputations and brain injuries, in the scope of their employment. He is also adept at handling personal injury cases at his law office, as some on-the-job injuries quickly turn into third-party lawsuits. For his accomplishments, he holds an Avvo "Superb" rating, and the American Institute of Personal Injury Attorneys honored him in its "10 Best" Attorneys and Firms for Client Satisfaction lists. 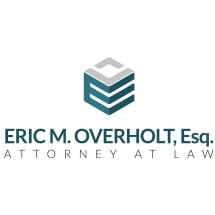 Having represented hundreds of clients, Mr. Overholt has handled countless types of minor to severe injuries such as repetitive use conditions, traumatic injuries, car accidents, injuries that require surgery and those that involve class action suits. At the law office of clients find a source of support and a way to ensure they are heard and their needs are met.